UMBC has opened my mind to what I can accomplish in my career. I would honestly not be where I am today if it wasn’t for the amazing faculty, staff, and friends at UMBC. Everyone is very passionate about what they do and we fuel each other to achieve greater goals. After taking the bronze at MHacks, a major student programming competition at the University of Michigan, for a haptic feedback suit that makes virtual reality more immersive, Bishoff’s team was invited to participate at the Global Hackathon in South Korea. Bishoff is a member of Tau Beta Pi, the engineering honors society, and received a Northrop Grumman Scholarship and TIAG Scholarship. He has interned at Google and the U.S. Department of Defense. 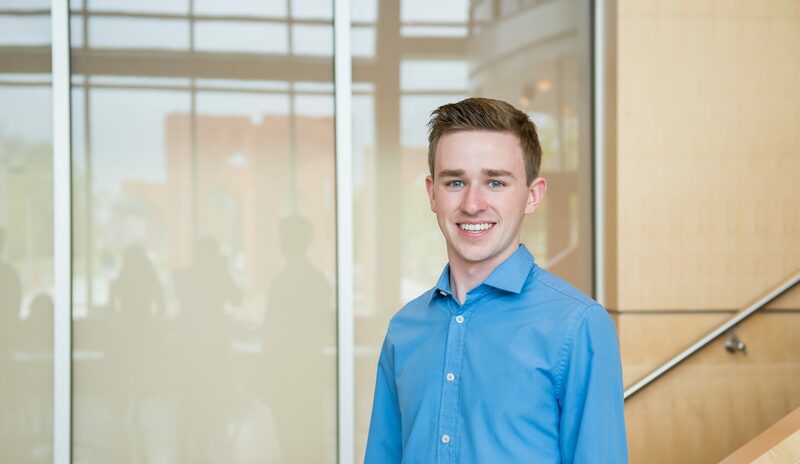 He also completed a summer undergraduate research fellowship through the National Institute of Standards and Technology (NIST), and served as a research assistant in the MAPLE Lab and an undergraduate teaching assistant in computer science. Soon after graduation Bishoff will start as a software engineer for the rideshare company Lyft. Image: Michael Bishoff, second from the left, with fellow HackUMBC organizers during the closing ceremonies of the competition; photo courtesy of Michael Bishoff. Portrait by Marlayna Demond ‘11 for UMBC.